Sometimes you come across a gizmo or gadget that stands out from all the rest. Maybe it has a special feature you’ve never heard of before, or an appearance unlike anything you’ve ever seen. There’s nothing quite like finding a piece of hardware that really resonates with your style and also combines a functional aspect that gives you more than you bargained for. Axent Wear was created by UB Berkley Alumi who have a passion for artistic and creative technology. 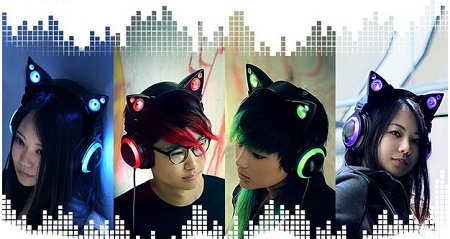 They created a pair of cat ear headphones that will not only let you listen to your music, but allow your friends to listen in too. There are speakers in the cat ears on the top of the band for when you want everyone around you to listen in, but you’ll still have your over-the-ear cups to use when you’d rather listen alone. These have LED lights in the ear cups and the speaker portion on the cat ears. These are available in red, green, or purple LEDs, and will cost you $150. If you really want to get fancy, you can pay $2,000 and get an exclusive pair that has a custom paint job with iridescent, metallic, or matte colors. Of course, if that’s not enough money to spend on one pair of headphones, then you can put down $10,000 for a custom paint job and changing LEDs. You would also get a personalized painting from the headphone designer. This is a crowdfunding campaign, but one that has already blasted past its goal.